Sure, you might want to spend a lot of time thinking about the cabinets in your kitchen, but you only have to see them for an hour (if that) a day. Otherwise, you’re spending the most time in your master bedroom, where you go to sleep every night. Naturally, then, what you’ve come here for is inspiration, and wouldn’t you believe that we’ve got inspiration in spades! What follows are 70 awesome examples of perfect master bedroom designs. Each one is completely custom and demonstrates a principle of design that’s worth paying attention to. So, stop being a dope! Check out these 70 custom master bedrooms, and then get all the inspiration you need for a relaxing and exciting master bedroom design of your own. For a luxurious look, wood paneling does wonders. Also, check out that floating wall concealing a television and an electric fireplace. 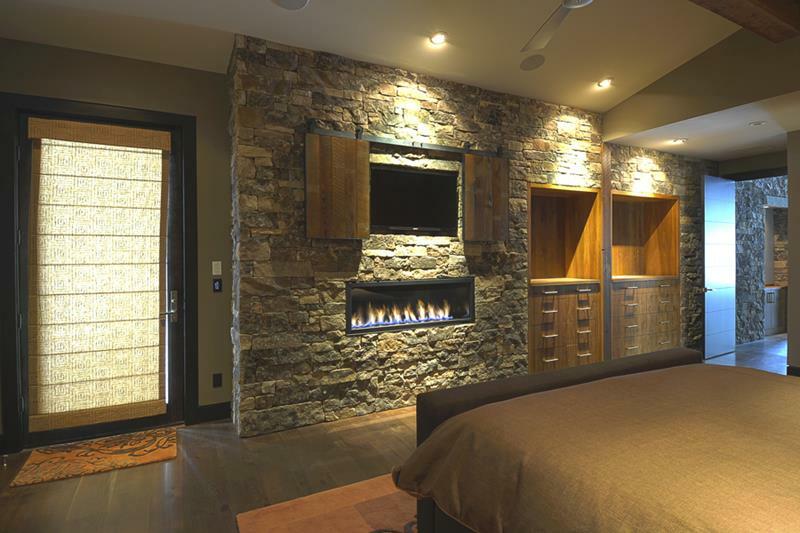 Many will want to conceal the television in their custom master bedroom. Here’s an interesting idea for how to do so. Paired with bright lighting and creamy walls, the rich fabrics of this custom master bedroom featuring a Tuscan vibe really stand out. Who needs a television in their master bedroom when you have a view like this to enjoy? Something you should always consider including as part of your master bedroom design is a seating area at the foot of the bed.